Two weeks ago my sister, the mother of two twin boys, called me. She was sick of picking up Legos! She wanted me to sew a playmat for the boys that when they were done playing could just be drawn up into a bag for storage. She must have been reading my mind, because that was just the bag of the month Jenny and I had been planning for November. 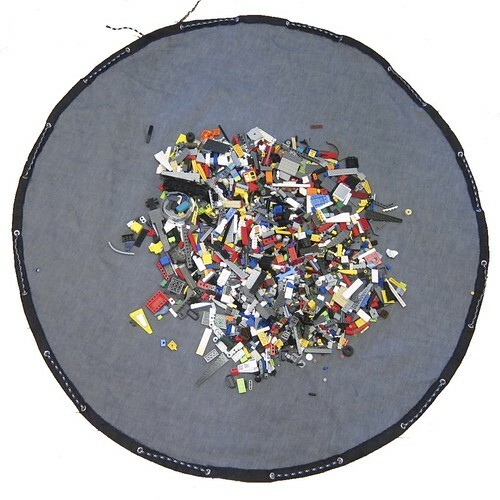 Jenny and her brother had bags like this when they were kids that were actually available from Lego. When her boys were young she went to buy them one and Lego didn’t make them anymore, so she made one herself. The denim held up to years of play and is still in use today. My sister wanted us to make one that was big enough for both boys to sit and play on at once. That wasn’t going to work for two reasons; finding denim large enough and the finished bag filled with toys would just be too heavy. Instead I made two bags, one for each boy. 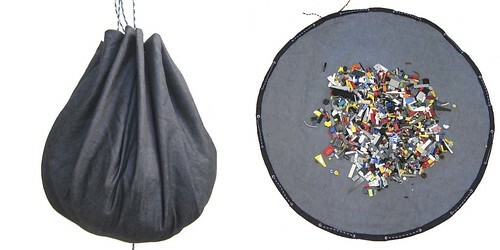 Each finished bag is 46″ in diameter, enough room for plenty of play space and yet still small enough when pulled together to hang from a hook in their playroom. 150″ of 3/8″ rope We found the rope at a hardware store and it came in all sorts fo great colors, reds, greens, yellows. I went with one that was a blue, white and black pattern. 1. 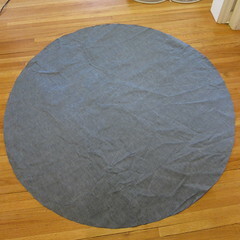 Draw and cut out your circle of fabric – This step is easier to do with two people. Lay it out. Tie a piece of string to your fabric marking pen and a chopstick or knitting needle. You want the string to be 24″ long between the two. 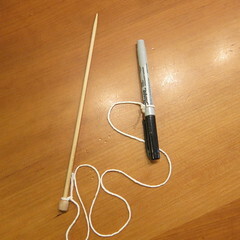 Put the chopstick in the middle of the fabric and draw a circle with the pen. 2. 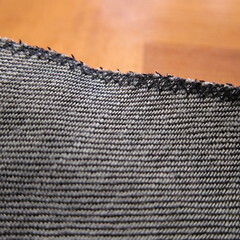 Edge the circle – Sew a zig-zag stitch around the edge of the circle. We went around twice to make extra sure it wouldn’t fray. If you have a serger that would be a much better way to edge this. Just keep in mind the serger cuts off some of the fabric, so you will have a slightly smaller bag (or you can start with a slightly bigger circle). 3. 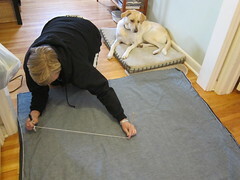 Hem the circle – Turn the edge of the circle in 1″ all the way around and pin it in place. You will get some puckers. 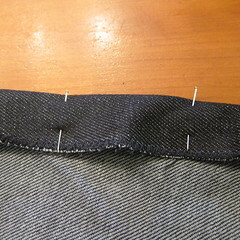 Sew into place about 1/4″ in from the zig-zagged edge. 4. Add eyelets – Now, you can do the math and figure out the exact spacing of the eyelets or just use a simple folding method like we did. Fold the circle in half. Place a straight pin to mark each fold. 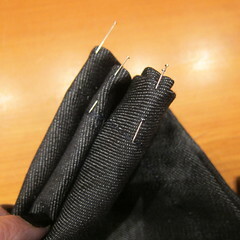 Fold in half again and place a pin at each new fold. 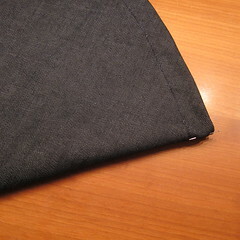 Make sure where there are two layers of fabric to mark the fold on each layer. Fold in half one more time and mark the new folds. Open the circle up. You should have 8 pins. Now place two more evenly spaced pins between each two on the circle, for a total of twenty-four pins. Using the eyelet tool install an eyelet at each pin. 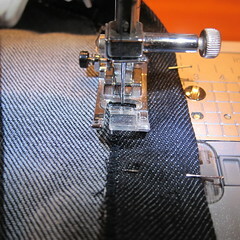 Make sure the eyelets are in the middle of the hem and not over your stitching line. 4. Weave in rope – Cut a piece of rope that is about 10 or so inches bigger than the circumference of your circle. 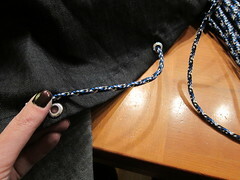 Weave the rope up through one eyelet and down through the next all the way around. Securely knot the ends together. 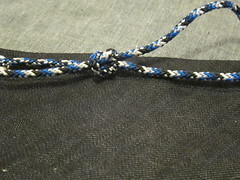 Depending on what the rope is made of, you can melt the end of it to keep it from fraying or use some glue. You could dress your bag up with appliqués or embroider on an initial. They make a great Christmas gift. I know my nephews are both getting them along with some new Legos. The eyelets are a good idea. 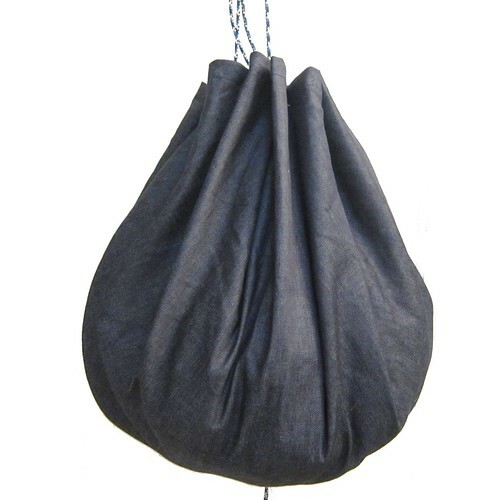 With thick fabric like denim, they’ll work better than running a drawstring through a channel. Thanks! Dot – that does seem to be the case & you want it to be easy for kids to close up so things get put away. I used to make these as gifts. I used double sided quilted fabric and bias tape around the edges. I also used the “corners” that were cut off to make the circle as pockets on the inside. The raw pocket edges were also encased with bias tape. 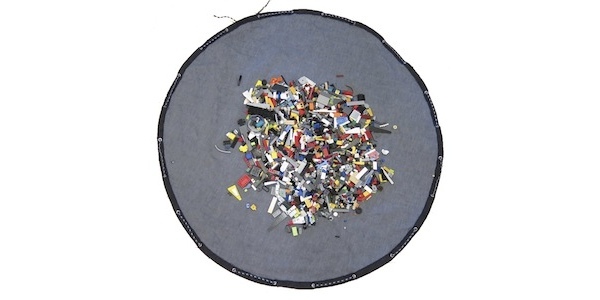 It made a great play mat for toddlers when visiting friends as well as a diaper changing spot! Jerrie – Those sound really nice. I kept these very simple, because a solid color is really best for playing Legos on. There are so many ways you can change them up though. Susi & I were just talking about how you could paint roads on the inside for a car playmat. I wish I had these when my boys were little, but I’m thinking about gifting one of these to a friend who makes rugs, she always has her fabric ribbons on the couch or floor while she is working.. then gathers it up to put it away, this would be awesome for her!! Thank you!! Marianne – What a clever idea for a crafter. I have a 2yr old boy with a ton of hot wheels that we tote all over the world with us…I think creating one of these will seriously change the quality of my life…THANKS!! 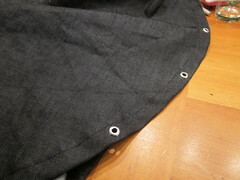 What did you use to make the small holes for eyelets?. I ended making buttonholes instead.Would like to know for next time. I’m trying to remember exactly since this was 4 years ago. I’m pretty sure we just made the holes with small embroidery scissors.